Sporting Kansas City is the first team in MLS history to hold a team to just one shot, accomplishing the feat twice in the same season. The first happened in a 0-0 draw at Los Angeles against the Galaxy on June 2nd. Sporting repeated the feat in the sweltering heat during a 3-0 victory of Seattle Sounders FC on Sunday afternoon. 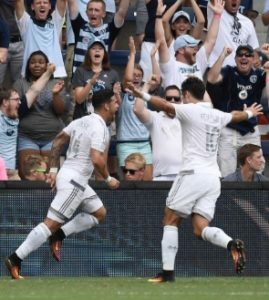 During the club’s 82nd straight sellout in Kansas City, Dom Dwyer scored twice and Jacob Peterson added a third. Seattle did avoid becoming the first MLS team to go an entire match without a shot, but their lone attempt did not even force a save. Sporting KC moved from 7th to 4th in the Western Conference. Their next two matches are against MLS Cup Champion Portland.